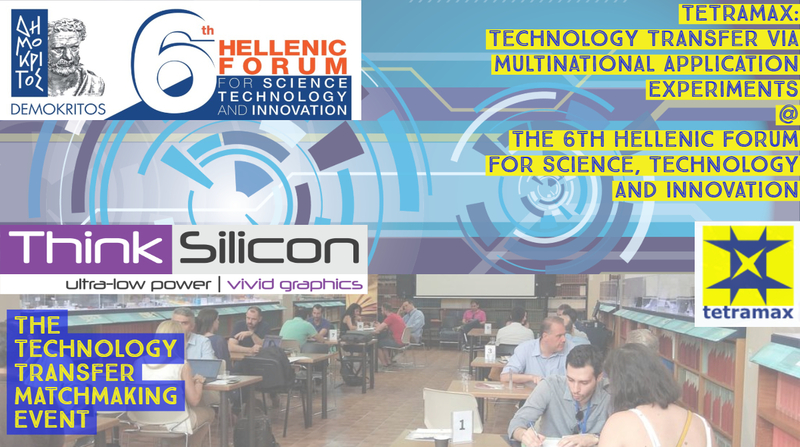 Think Silicon participated last week at the 6th Hellenic Forum for Science, Technology and Innovation, which is co-organized by EEN, PRAXI Network, and the National Centre for Scientific Research (NCSR) "Demokritos" at Athens, Greece. During the 4 days of the Forum, world renowned speakers from all around the globe discussed global scientific developments. During this event Dr. Georgios Keramidas, Chief Scientific Officer of Think Silicon S.A., presented TETRAMAX as well as the funding opportunities offered by this initiative within the domain of customized low-energy computing. During the last day of the Forum, a Matchmaking event was held offering delegates the possibility to meet with high tech companies and scientists who work in similar fields, to create new connections, and potentially forge research and technical collaborations in the fields of telecommunication and information technology. So, the Matchmaking Event was the perfect place for TETRAMAX to make its aims and objectives known to the most appropriate target audience. Within the frame of the Matchmaking event, Dr. Keramidas had the chance to meet several companies and present the funding opportunities offered by TETRAMAX through pre-arranged 20-minute meetings with organizations that have the potential to collaborate in commercial, research and/or technical level. The presentation and the meetings were well received by the audience and the targeted companies, and many questions were answered revealing the high interest for the TETRAMAX project and its funding opportunities.